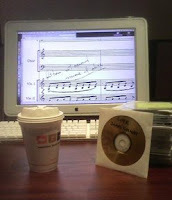 10:38 a.m. (EST) -- I moved the coffee away from the CDs... just in case you were getting nervous. 1:10 p.m. -- My spider sense is tingling! 2:15 p.m. -- Today's been very nonlinear, plot-wise. 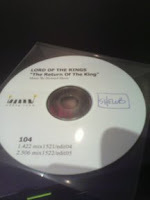 Not much of ROTK was scored in order. Bits were, here and there, but mostly music was composed as scenes were completed (or neared completion). I've been all over so far... Edoras, Minas Tirith, the film's opening, etc. Some very, very interesting finds, especially as the illustrate how differently the film was edited as it progressed. But it's time a lunch now! Forgot to mention, yesterday was the six-year anniversary of my first trip to these offices, as well as J.R.R. Tolkien's birthday. Nice confluence, eh? 3:55 p.m. -- The double fiddle sessions now. Dunharrow is proving itself fertile ground. 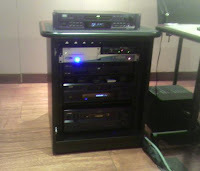 4:29 p.m. -- The ROTK trailer recording sessions! 5:05 p.m. -- Dinner time. Back later for a final wrap-up. 12:00 a.m. -- Part of me is happy I didn’t make it to the end today. I want to come back. I want this to go on. What a great day. The Return of the King is… begun. I don’t honestly know how much more there is to delve though. As I pointed out before, it’s not all in order. 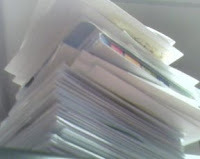 Although I can see how many CDs are left in the stack, I think some have been stockpiled elsewhere. I didn’t see the DVD sessions in with the others. So there’s really no telling just how much is left. I’m not done, and as I say, I’m glad for it. I didn’t expect to be… I’m ahead of schedule, which is nice, but frankly I’d have been disappointed if I’d made it through everything this week. As I say, I’m happy to have a reason to be back soon. The point here is that today I hit DA91… and that doesn’t include some of the material I found directly on the servers last summer. That doesn’t mean 91 full CDs have been flagged. 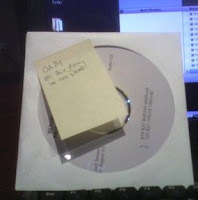 Often there are just 1 or 2 compositions of note on a disc… but still, 91! And we’re still going! Some pieces give you a glimpse into the creative process… both compositionally and editorially… you really get a better sense of how these films were put together. Some of the alternate compositions simply stand as superb pieces of music… an LOTR 3.5, if you will. Some reveal how Shore composes. Some reveal how he conducts and records… but everything shows something. It’s not just a grab bag of slightly out-of tune alternate takes or anything of that sort. It’s a huge task, but it’s absolute bliss. I’d love to tell you exactly what I found today… how composition X was first envisioned, where scene Y originally belonged. But as you can see, this is all still coming together, and it’s better to hold the enthusiasm in check than to say something too early. It’s fun to find a way to fit this all in with the book’s text, too. Certainly the Annotated Score’s “Unused” boxes will be proliferating after this trip! But for the moment, sleep is needed. I have wake-up call in 5 hours, a decent little drive and an early flight to make. If my brain cells can align themselves tomorrow afternoon, I’ll try to address some specific questions people have posted in the comments. But in the meantime, I’m going to dream of the music I heard today. Anyone who cares to join me is more than welcome.